▷ Clarion MAX983HD update. Speedcam for your maps. Download update. Free custom download. 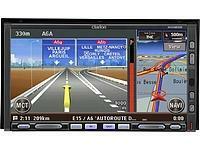 In order to update your GPS device: Clarion MAX983HD with the latest update, follow next instructions. First of all, be sure you got the update file for your Clarion MAX983HD device, downloaded from SpeedcamUpdates.com. Rename the downloaded file to CameraData.bin. Copy the extracted files into an SD memory card in a folder named Clarion. Plug the SD memory card into your Clarion MAX983HD navigation system. Select "Setting / Import Data / Safety Camera Import.". Then click OK to copy the files.